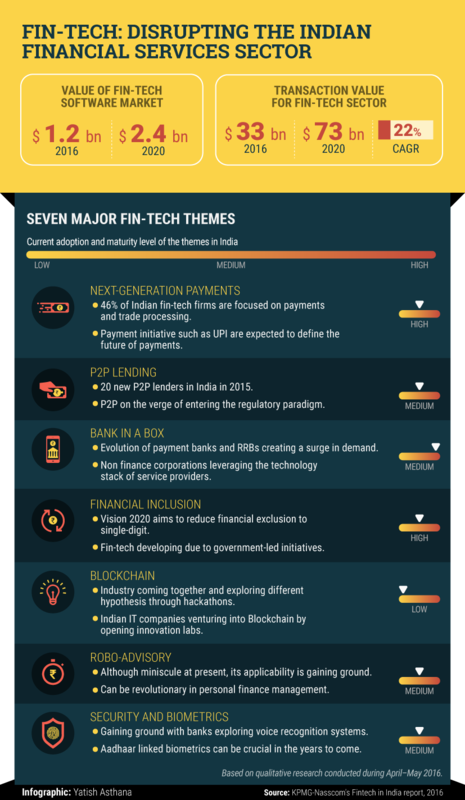 India's financial services sector is set for a transformation in coming years thanks to the emergence of fin-tech startups that are changing the way payments are processed, loans are sanctioned and personal finance decisions are made. According to a joint report by KPMG in India and Nasscom 10,000 Startups, the market for fin-tech software in India as also the total transaction value for the segment will likely double over the next four years. Growth will be driven by rising customer expectations, the e-commerce boom and increasing usage of smartphones, says the report titled 'Fintech in India: A global growth story'. Within the fin-tech sector, digital payments and financial inclusion have received plenty of attention from both the government as well as investors. But there are myriad opportunities also in the lending and security biometrics segments of fin-tech. Specifically, several startups have ventured into peer-to-peer lending and remittances. Many of them have attracted investors, too. A clutch of investors are also beginning to look at robo-advisory services, which uses analytics to provide asset management and financial advice, and bank-in-a-box as new investment avenues. Blockchain is another emerging tech-mammoth and has the potential for mass market implementation in the future, says the report. Here's a quick look into the report's main findings.